My travel schedule for the first four months of the year has been pretty hectic, verging on the brutal, although it was partly self-inflicted. This kicked off with two month-long visits to the USA, starting with a trip to Miami and Phoenix and followed by another that saw me travel from New England to Arizona by train. Since then it’s calmed down a bit, so I thought that before I jet off on my next adventure (a week today I should have just arrived in Japan) I really ought to finish writing up the previous one. This saw me spend three days at the London Coffee Festival, head home on the Saturday evening and then turn around on Sunday to fly out to Thailand for the first time. This instalment of Brian’s Travel Spot covers my flight over with British Airways. I then spent a week in Bangkok, before catching the sleeper up to Chiang Mai, where I spent another week exploring the awesome speciality coffee scene there. I returned to Bangkok, again on the sleeper, spent three days in the capital, then flew back, again with British Airways, which will form the fourth and final part of this Travel Spot. This trip had a handful of firsts for me, the most significant being that it was my first ever visit to Thailand, flying into and out of Bangkok with British Airways. I was doing the whole trip in business class (or Club World, as British Airways calls its business class) which, scarily, is becoming commonplace for me, even though it was less than a year since I flew business class for the first time ever on my way back from Vietnam. This is largely down to work giving me a generous travel budget, which means that for the first time in over 20 years, flying business class has been within my budget (well, strictly speaking, within work’s budget). That said, if you did ever think of flying business class, then flying to Thailand might be the one to splurge on, since it’s comparatively cheap, about half the price of an equivalent flight with British Airways to the US, Japan or China. Since that first flight back from Vietnam, I’ve flown business class six times, including to and from Shanghai with China Eastern and three times back from the USA, all with British Airways. However, on all three of those flights, I flew to Heathrow: this was the first time that I‘ve had the pleasure of flying out of Heathrow Terminal 5 in Club World. I have to say that Terminal 5 is one of my favourite points of departure and I had another really smooth airport experience. Terminal 5, which is dedicated to British Airways, has its own Club World bag drop and check-in area (which is shared with First Class) at the terminal’s southern end. Although it was the first time I’ve had to queue for bag drop in a long time, the queue moved quickly and within 10 minutes of arriving, my trusty rucksack was deposited with my old friend, the over-size bag drop. Another perk of travelling Club World at Terminal 5 is that you get your own little security area immediately next to the bag drop desks. There were two x-ray machines and one body scanner and again, although there was a short queue, I was through within 10 minutes and, for once, none of my bags got hauled aside for a closer inspection. I had intended to get to the airport a little early to allow time to enjoy the lounge, but recovering from London Coffee Festival and sleeping with a dodgy back (more on this later) meant a slow start, so by the time I was through security, there wasn’t much time to kill. I’m slowly learning the layout of Terminal 5, which has a main building, housing the A Gates and all the main shops and restaurants. It also has two lounges, North and South. There are also two satellite buildings, which house the B and C Gates respectively. These are connected by a short, underground transit line which runs every few minutes. These satellite gates have limited seating, a few shops and a couple of cafes or restaurants, although the B Gate area also has another lounge upstairs. Typically, my flight was departing from the C Gates, which has no lounge at all, the very definition of a first world problem! Having experienced the North Lounge on my way back from Phoenix, which I found rather large and anonymous, I decided to head over to the B Gates and try the lounge there. It also meant that I would be that bit closer to my ultimate destination when it came time to board. This, it turned out, was a good choice, since the B Lounge is the designated quiet lounge which, for once, lived up to its name. You could have heard a pin drop. There was plenty of seating, including tables, computer desks and individual seats, all with copious power outlets and free Wifi. There was a light buffet lunch with a choice of three types of sandwiches, two different soups and a couple of cakes. Plus lots and lots of drinks. Having not eaten since breakfast, some four hours earlier, I helped myself to soup and a couple of sandwiches, but other than that, I didn’t really explore since I’d arrived only an hour before my flight was due to leave. Naturally it said on my boarding card that this was when boarding was due to begin, but the monitors said otherwise. The next time I looked up, 20 minutes later, the flight was being shown as boarding, so I heading over to the C Gates. The satellite buildings are pretty close together (you can see them out of the windows) and I reckon I could have walked there in about five minutes, although I’d probably be arrested and in any case would have to dodge various taxiing aircraft. Instead I descended into the bowels of the building, jumped on the transit and popped out the other end, a journey which was more like 10 minutes long! For once I timed my arrival almost perfectly. There was a large queue of economy passengers waiting to board, but nothing at First Class/Club World, most of who had already got on. They had just announced general boarding when I swanned up and walked straight on, ahead of the crowd. You can see what I made of Club World after the gallery. I’m now starting to get the hang of British Airways and Club World, this being the fourth time that I’ve been in the front of the plane. That said, the novelty of turning left hasn’t yet worn off! My first three times flying Club World, once from Chicago and twice from Phoenix, have been on Boeing 747s, whereas this was a Boeing 777-200, another of British Airways’ older aircraft. It was a far cry from the modern Boeing 777 I had when I flew with China Eastern and even further from the brand new Boeing 787 I had the joy of flying on when I came back from Ho Chi Minh City with Vietnam Airlines. 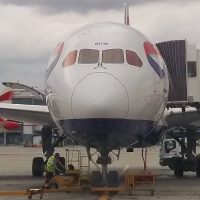 That said, since I was sitting up front, its age was less of an issue than when I flew economy to Boston on another British Airways 777-200 in February. Unlike the angled seat arrangements used by the other airlines, British Airways arranges all its Club World cabins the same, with the seats aligned with the fuselage. Therefore my 777-200 had the same layout as the 747s that I’d flown on before, with pairs of seats, one facing forwards, the other backwards. These are arranged with one pair on either side and two pairs in the central aisle, so there are eight seats in each row across the width of the plane. The seat was pretty standard, with an identical layout and similar features to the 747s. There was the usual fold-out table and large TV monitor, while the seat itself was fully-adjustable, with a fold-down foot-rest at the end. When the seat’s converted into a lay-flat bed, it does so by joining (almost) seamlessly with the foot-rest. The only downside is that access to the window-seat is past the foot-rest, so when it’s converted into a bed, the person by the window has to step over you to get in/out. There’s a tray under the table/monitor, which is pretty much the only storage space, although it is big enough to take me laptop, which is handy. It also comes with a power-assisted privacy screen between the two pairs of seats, controlled by a button at the top. With the seat able to slide back and forwards, and with the table able to slide its full depth on runners, finding the right spot for the laptop was a piece of cake. It also meant that I could work on the laptop and watch my progress on the in-flight map at the same time, something that’s virtually impossible in economy. One minor thing was that on this flight, I keep hitting the remote control with my shoulder as I manoeuvred myself in and out of my seat, which I don’t remember doing on previous flights. Maybe I didn’t have screen on as much on the other flights and so didn’t notice, or maybe this time it was my bad back that was making me clumsy. There was, however, one major difference between this and the 747s I’d flown on before. Although there was at-seat power, the plane only had US-style sockets, and, while I had adaptors, they were all in the hold. Oh well, something to remember for the return flight… Fortunately, I was planning on getting some sleep on the flight, so I could do what I needed on a fully-charged battery. You can see read a little more about the plane and its unusual layout after the gallery. Chatting with the cabin crew, it soon became clear that they didn’t much like the aircraft. It is unusual in the British Airways’ fleet in that it has no first class cabin, so the front of the plane, where first class is normally tucked in, was given over to Club World, with four rows and 32 seats in total, while there was another, smaller section between the galley and premium economy (World Traveller Plus in British Airways lingo), with another two rows and 16 seats. This split layout was the major bugbear of the cabin crew, since it meant that the cabin service was split between the two galleys, the one between the two Club World sections and one right at the front, behind the cockpit, which normally serves first class. So, rather than everything being in one place, stuff was split between the two, with the cabin crew forever going to the wrong galley to get things. If this sounds like unnecessary complaining from the crew, bear in mind that British Airways cabin crew don’t fly regular routes or regular aircraft. Depending on which aircraft they’ve been trained on, a member of the cabin crew could be on a 747 in Club World on one flight, upstairs in World Traveller Plus on an A380 on the next flight, and then in the back of a 777 in World Traveller on the flight after that. So each flight is a learning exercise! It’s also worth bearing in mind that crews never regularly fly together, so each time you fly, the chances are, the cabin crew on your flight will only have met each other that day (or on the flight over if you’re catching the flight back). Given that, the level of teamwork on display, plus the smoothness of the service is really impressive! I’d like to see an office function like that if it had a different set of staff in every day! Back to the cabin itself. I was in the front section, in Seat 4B, on the aisle, but in one of the pairs on the side, rather than the four in middle. This meant that I got to turn left at the door and I also ended up flying facing forwards, which I marginally prefer. The seat was three rows back from the front (despite being 4B) and pretty much right in front of the engine. It seemed to me that it was really noisy during take-off, although it was no noisier than your average flight once we were cruising. You can see how I got on during the flight after the gallery. We were scheduled to leave at 16:00, but pushed back at 16:05 and then did the usual taxiing around Heathrow for a while. Once, on a short, internal flight from Arlanda Airport in Stockholm, we taxied around for so long that I thought the pilot had given up on flying and was going to drive there instead. However, in this case, driving to Bangkok was out of the question and by 16:25, we’d found the end of the runway and were set for take-off. The flight was pretty much full, with every seat in Club World taken. With the mid-afternoon take-off time, there was no great hurry to serve dinner, so I decided to make myself coffee. Normally, I pre-weigh my beans before the flight, but in this case, I had my scales with me, and, having boarded the flight relatively early, I took the opportunity to weigh the beans out at my seat before we pushed back (once the aircraft starts moving, the vibrations make it impossible to use the scales). Once the seat-belt signs were off, I wandered up to the front galley and said hello the cabin crew (which is where I found out about their dislike of the aircraft). I had to wait while tea was made for the pilots (British Airways pilots are, it seems, fuelled by tea), after which the cabin crew were happy to fill up my Travel Press with hot water. Normally I’d disappear into the toilet to make the coffee, since the baby-changing tables in older aircraft make for an excellent, stable surface (the ones in the new 787s are disappointingly baby-shaped, ie curved, and therefore of much less use for coffee-making). However, one advantage of the split galley set-up is that most of the crew were in the rear galley getting ready for the dinner service, so I pretty much had the place to myself and the crew let me make my coffee there (another first for me). After some experimentation while flying over the last couple of years, I’ve come to the conclusion that my Travel Press is by far the best option for making coffee in the air, particularly when flying economy. However, the extra space afforded by business class has seen my Aeropress make a comeback, so I decided to give it a go here (my original plan, had I had more time at the airport, was to make myself an Aeropress in the lounge before I got on the plane). Coffee made, a lovely Ethiopian single-origin from Ox Coffee in Philadelphia, I took it back to my seat, along with some biscuits which the cabin crew had rustled up for me. I managed to get a little bit of work done while waited for the drinks service, which came along, followed by dinner at around 18:00, 1½ hours after take-off. [As an aside, British Airways has now introduced a Peruvian coffee from Union Hand-roasted in its lounges and in the First and Club World Cabins, so we’ll see what that’s like when I fly to Tokyo on Friday]. Another nice thing about flying Club World is that you get a menu, although in this case, I’d pre-ordered a vegetarian meal, so didn’t really need it. My starter, goats’ cheese and beetroot, with a generous side salad, was served as we flew over western Poland, with the main course arriving at 18:30 as we flew over eastern Poland, heading into the setting sun, which had rapidly approached to meet us. My main, which was different from the vegetarian choice on the menu was, appropriately enough, an excellent Thai vegetable curry with rice. By 19:00, when we were almost all the way across Ukraine, dessert arrived in shape of a flourless chocolate cake. I ordered a glass of port and managed to blag some cheese and biscuits to go with it. By 19:15, dinner was over and cleared away, by which time we’d just crossed over into Russian airspace. It was dark outside and I was feeling surprisingly sleepy, so, with about eight hours flying time left, I decided to call it a night and tried to get some sleep. You can see how well that went after the gallery. One of the problems with east-bound flights that leave at four o’clock in the afternoon is that, while the flight is scheduled to last 11 hours, which is long enough to get a reasonable amount of sleep, it departs sufficiently early in the day that you can’t go to bed too soon into the flight, hence you don’t actually get that much sleep (one of the main reasons that I flew with China Eastern when going to Shanghai at the end of last year was that the flight left that bit later, taking off in the early evening). On this flight, I decided to try to get some sleep at about 19:30, which is ridiculously early for me (I consider going to bed before midnight early!). However, in this case, it was my only chance of getting some sleep, particularly since the cabin crew would most likely be waking me up for breakfast at around two o’clock in the morning, UK time. So, how did I sleep? In a word? Badly. I went to bed not long after we crossed over into Russian airspace and woke up somewhere over India. Except to say that I woke up over India would be a little disingenuous. It was over India that I gave up the uneven battle against sleep and wandered up to the galley to make myself my morning coffee, where I had a chat with one of the cabin crew. I love talking to the cabin crew, particularly in the middle of the “night” on flights like this, since they often have little to do and welcome the company. It’s a particular habit of mine when flying overnight in economy since I can’t sleep anyway. I’m not sure why I couldn’t sleep. I’d been sleeping badly for several days, partly because of my back, which had been playing up for a few days. I’d tweaked it in the run-up to the London Coffee Festival and on the last day there, it had been particularly stiff. However, I wasn’t in that much pain, certainly a lot less than I thought I would be, so I don’t think it was entirely that. In the end, I put it down to a combination of not sleeping well on planes, my back and the weird timings. I can’t remember the last time I went to bed at 19:30! This, by the way, does not bode well for next week’s flight to Tokyo, where I’m due to leave Heathrow at 11.40 in the morning and arrive in Tokyo at 07:10. At first glance, this doesn’t look too bad, until you realise that 07:10 in the morning, Tokyo time, is 23:10 back in the UK. I’ll be getting off the plane before my usual bedtime! Whether I even try to sleep on the flight remains to be seen. The lack of sleep aside, the rest of the flight went smoothly. We crossed Indian coast and flew out over the Bay of Bengal at around 07:30 Bangkok time, not long after dawn. By then, people were starting to wake up and open the blinds, which was nice, although they were also starting to make a lot of noise which felt inconsiderate given how many people were still trying to sleep. Breakfast was served at 08:00, aka 2 o’clock in the morning, with fruit and bread, followed by an optional cooked breakfast which came around about 20 minutes later. Mine was a scrambled egg and mushroom Florentine on a toasted bun, which was very tasty indeed. I did a little more work and then packed everything up in readiness for landing, the flight touching down pretty much on schedule at 09:20 Bangkok time. You can see what I made of Bangkok and how I got to my hotel after the gallery. Normally I end my Travel Spots about flying at this point, but in reality, this rarely the end of the journey (just as arriving at the airport to catch the flight is rarely the start of the journey). So I thought I’d tell you a little bit about Bangkok’s Suvarnabhumi Airport and my journey from there to my hotel. Suvarnabhumi is one of two international airports in Bangkok, but the one you’re mostly like to arrive at if flying from the UK. It’s really big and modern, having only opened in 2006, acting as the main gateway for Thailand and as a regional hub. We landed on time and within 20 minutes, we’d reached the gate and I was off the plane, wandering through the massive arrival halls. I’d heard bad things about the queues at immigration, but that too was a breeze, with just a short wait. Before long, I was waiting at the luggage carousel for my bag, which also promptly arrived. By 10:20, an hour after landing, I’d got my bags, cleared customs and was ready to find my way into central Bangkok and my hotel. I withdrew some money from an ATM (I never change money before I travel, since it’s always far cheaper, and often easier, to withdraw money once you’re there, particularly if, like me, you have an ATM card which doesn’t charge fees for withdrawing money overseas). I also stopped at the first likely-looking kiosk and bought a SIM for my other phone (yes, I have two Smartphones, one of which is a back-up since my main phone has twice turned itself into a brick and I can’t afford to be without one when I’m travelling). This cost me just £15 for 15 days, with unlimited data! Then it was off to catch the train. Overall, this was one of the smoothest airport experiences I’ve had on arrival. The biggest problem was getting into the centre. Far too often, public transport is the weakest link when it comes to airports and Bangkok proved no exception to that rule. A common problem is that it’s far too difficult to buy a ticket and Bangkok is a good case in point. Having found the train station (don’t head down the “Express Line” side; that shut several years ago, you need the “City Line”) I discovered that the ticket machines only take cash, not cards. Well that’s okay, because I’d just got some cash. Except the ATM gave me 500 Baht notes (roughly equivalent to £10 notes) and the ticket machines won’t take 500 Baht notes, so I had to queue up again, this time for the only human cashier at the station. It was probably quicker to get through immigration, collect my bag and go through customs than it was to buy a train ticket. On the plus side, the train to the centre costs 45 Baht (that’s just £1) and the journey takes under 30 minutes, with trains running every 15 minutes. By 11 o’clock I was on the (thankfully air-conditioned) train, heading for the end of the line, Phaya Thai. There are six intermediate stops, with Makkasan, the second to last stop, interconnecting to the Metro, but I was heading for the Elevated Railway, which connects at Phaya Thai, so I didn’t have to worry too much about when to get off, which was just as well since I was very tired at this point. Bangkok’s public transport system has improved a lot over the last few years and it’s still improving with a new metro line under construction. It’s actually pretty good, reasonably fast, and not too expensive, as long as it goes where you need to go. With this in mind, I’d chosen to stay at places near public transport, but there are large swathes of the city where you’re pretty much on your own. One of the downsides to Bangkok’s public transport is that the different systems (Elevated Railway, Metro and Airport Line) are run by different companies, so you have to buy separate tickets for each, which involves knowing where you are going since the tickets are priced by distance, with the whole process of buying tickets slowing things down… That said, it cost just 44 Baht to get to Saphan and the trains are very frequent, so it didn’t take me long. After five work-related days in Bangkok, I was off on the next stage of my adventure, taking the sleeper to Chiang Mai for a week in the north of Thailand. Check out how that went (which includes more about getting around Bangkok by piblic transport) and the rest of my adventures on Brian’s Travel Spot. You can also find out how I got on during the flight back. This entry was posted in Bangkok, Brian's Travel Spot by Brian Williams. Bookmark the permalink.